It's funny how quickly we forget the things that we've crossed off the To-Do list. Once it's erased off the blackboard, it's almost like it was never there! In that case, I really should just remember to update you more often then, hmm? Ah yes, we went to the Henty town garage sale and auction! We went as sellers, but couldn't help ourselves when this fireplace surround was being auctioned. No-one was in a buying mood, so Marty nabbed it for a meager $15. Can you believe that? 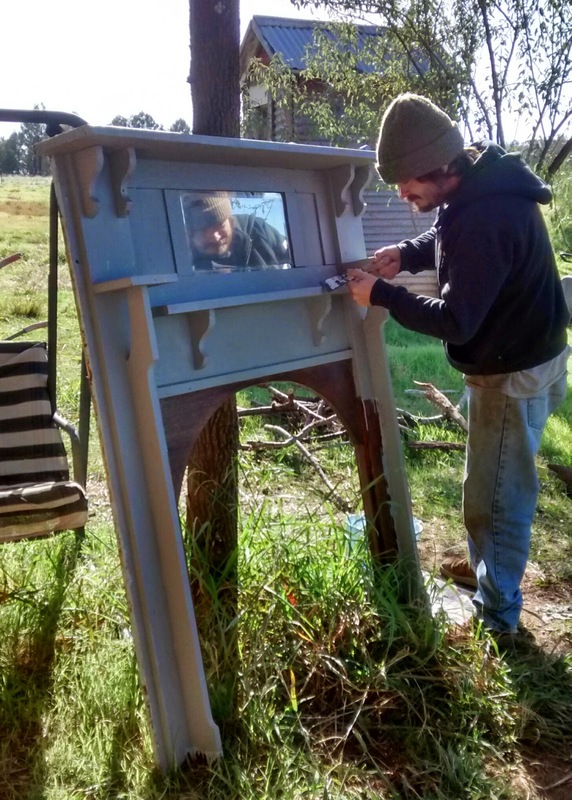 He cleaned it up and installed it into the (current) bedroom, and it's a pretty good fit. It'll look better with a bit of custom wood working and a coat or two of paint, of course, but we love it! Also, it was time to remove some trees from the North-West of the cottage. It's gotten much colder all of a sudden, and we wanted all the sun available that we could. Not to mention that one of the trees has been dead for 2 years, and the other is a peppercorn tree, which should not be so close to the house like that anyway. On that note, we purchased a whole bunch of trees on sale from the nursery the other day, and we're really excited about planting them. Of the 12 trees we planted to the North of the house last Spring, only 3 didn't make it, so we figured we'd get a few to replace them.. but instead we got 32! Mostly native trees and bushes good for wind-breaks and bird habitat, but also a Feijoa for Marty and a bay tree for me! 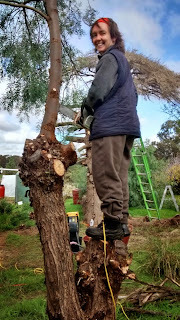 We've also been given quite a few different trees from our friends at the Permaculture Riverina group, and I think now is a good time to get them in. We've been getting a good amount of eggs lately, and the chooks have been visited by lots of dung beetles too, which is fantastic but kind of gross at the same time. :) Marty and I have been doing lots of planning and thinking about what we want from their permanent home, but that could be a long while off yet. We spend quite a bit of time considering what we want for the property. Much more time than we spend actually doing it at this stage! Marty also enjoys spending time researching the house's original inhabitants! I'll have to get him to write something about that here for you soon. This year, we've enjoyed starting the fire and keeping warm, and having a full wood shed is quite comforting. The tiny little Nectre 15 keeps the bedroom very comfortable all night, and keeps the rest of the house from being too cold to be in as well. I did attempt to use the old IXL No.4 this year also, hoping that I had some settings incorrect last year.. but no matter what I did, the oven wasn't able to get above a warm, but useless, 60°C (140°F), while the top was cooking dinner and boiling kettles. We'll to stick to the gas stove, and perhaps someday upgrade to a wood oven with hot water jacket and all that fancy stuff. We're quite comfortable though, and we're very grateful for that!